The beauty and diversity of the Alentejo landscape is second to none in Portugal. Combined with the quality of archaeological, monumental, architectural and ethnographic heritage, it makes the Alentejo a delight to explore. Our suggested itinerary below is not set and can be amended to suit individual requirements. On arrival at Lisbon airport, collect your hire car and drive to the town of Alcácer do Sal (88.8km). Overnight at Pousada Castelo de Alcacer do Sal, Baixo Alentejo (coastal). Explore the undeveloped Atlantic coastline between Troia and the Cape of Sines with its kilometres of uninterrupted beaches. Further south is the charming coastal resort of Porto Covo (80km) of which the main square is considered one of the jewels of popular Portuguese architecture. There is also a fine sand beach, an abundance of excellent fish restaurants and magnificent sunsets over the Atlantic. After breakfast, drive across the plains of the Alentejo – especially beautiful in spring when the wild flowers are in bloom – to Vila Viçosa (155km). The route will highlight the diversity of the region from coastal villages in the west, to the agricultural plains and vineyards of its centre and the lofty mountain peaks and historic hilltop villages in the east. For those interested in learning more about Alentejo wine, the Cartuxa Winery on the outskirts of Évora is worth a visit. In the vineyards, Roupeiro, Antão Vaz and Arinto grapes are cultivated to produce white wines, whilst Aragonze, Trincadeira and Tinta Caiada grapes are used for making red wines. Overnight at Pousada Convento de Vila Vicosa, Alto Alentejo (interior). Day at leisure. Visit the medieval hilltop town of Monsaraz, one of the most picturesque settlements in the region with white-washed houses, many adorned with colourful flower boxes, narrow cobbled streets and wonderful panoramas. After breakfast, head to the hilltop town of Crato (82km) and the Pousada Mosteiro de Crato - a 14th century monastery-fortress which has previously served as a castle, convent and palace. Nearby outdoor activities include hiking, horse riding and fishing. Overnight at Pousada do Marvao, Marvao. Day at leisure. Drive to Marvão (43km) for dramatic scenery as far as the Spanish border dotted with ancient villages and fortified towns – an ideal location for keen photographers and painters to practice their art. For outdoor enthusiasts the Natural Park of Serra de São Mamede (29km) is ideal for hiking, cycling and bird watching. Birds such as Bonelli’s Eagle, the Griffin Vulture, Sparrow hawks, the Short-toed Eagle, Black Kites and Eagle Owls can all be spotted within the reserve. After breakfast, drive to Lisbon airport for your return flight home. Set on a hillside overlooking the River Sado and a lush green valley on the Lisbon coast, is the Pousada Castelo de Alcacer do Sal. This impressive pousada is housed within a 16th century, former royal convent and set in lush, landscaped gardens close to the historic village of Vila Viçosa. This impressive pousada is housed within a 16th century, former royal convent and set in lush, landscaped gardens close to the historic village of Vila Viçosa. Built on the orders of Dom Jaime, the forth Duke of Bragança, the building served as a pantheon for the ladies of the house and a home for his unwed daughters. The elegant rooms are decorated in warm colours and adorned with period furniture. There is an outdoor swimming pool with terrace and guests can enjoy authentic local cuisine and international wines at the pousada’s restaurant. The historic towns of Estremoz (21.5km), Évora (65km) and Arraiolos (64.6km) are within easy driving distance, as is the Alqueva Lake (84.6km). 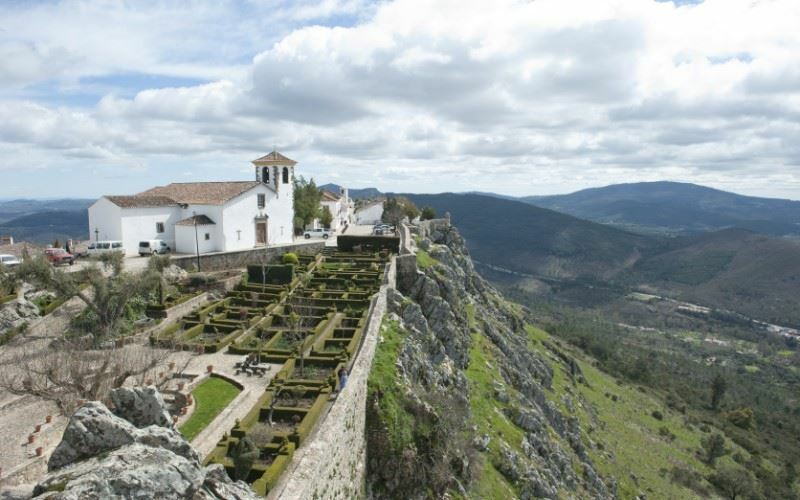 At an altitude of 1000 metres, the village of Marvão enjoys magnificent panoramic views across the Alentejo plain as far as the Spanish border. At an altitude of 1000 metres, the village of Marvão enjoys magnificent panoramic views across the Alentejo plain as far as the Spanish border. The Pousada, surrounded by 13th century castle walls, is made up of a small group of village houses and many of the original medieval features have been maintained. The Pousada offers a good base from which to visit other places of interest such as the Roman town of Ammaia (8km), Castelo de Vide (14km) and the mountain range and Natural Park of São Mamede (21km).